Michigan State University covers more than 5,000 acres and is one of the most beautiful campuses in the nation. Besides walking, students have many options for getting around campus, including many green transportation options. 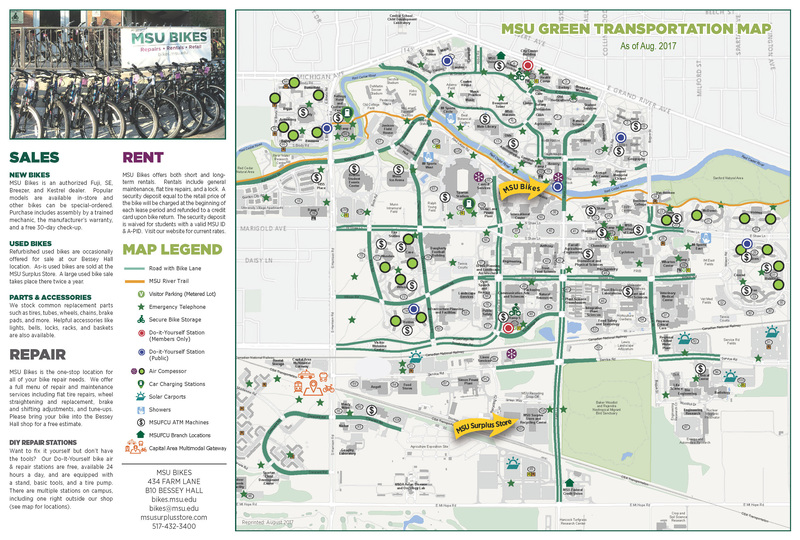 With more than half of its roads equipped with bike lanes and more than 20,000 bicycle parking spaces, MSU has been named a Bicycle Friendly University by the League of American Bicyclists. Additionally, MSU has installed several bike repair stations across campus, providing cyclists with a place to fix flats and make minor adjustments. MSU’s Bikes Service Center also offers a range of services for individuals or campus departments looking to rent, repair, buy or equip a bike. Students who bring a bike to campus must obtain a free bicycle permit from the MSU Police Department. The Capital Area Transportation Authority (CATA) bus system is easily recognizable, both on and off campus. Four bus routes run on campus until 2 a.m., and the Night Owl service provides late night transportation after the buses stop running. Students can purchase a semester pass or pay per ride. MSU offers seven Zipcar parking locations on campus. Students 18 years and older, including drivers with an international license, can rent a car to use by the hour or day. An MSU student not residing on campus property may register a vehicle as a commuter. An MSU student who resides on campus and is entering MSU from high school (regardless the number of credits or from where they were earned) is not eligible for a parking permit. An exception may be sought for extenuating circumstances via application with the MSU Parking Office. An MSU student residing on campus must be at least a second year freshman with MSU and have 20 finalized credits in order to obtain an MSU parking permit. Students transferring from a college or university must present proof to the MSU Parking Office that MSU has finalized 20 or more credits from their previous college or university. When eligible, students may purchase a parking permit on campus and register their vehicle through the MSU Police Department. It is a 75-minute drive from Detroit Metro Airport. The Michigan Flyer Airport Shuttle offers bus transportation to East Lansing for approximately $30. Buses run several times a day, and travel takes approximately two hours. The Capital Area Multimodal Gateway on campus houses the Amtrak Blue Water train stop and three intercity bus services: MegaBus, Greyhound and Indian Trails. Local CATA bus routes stop at the station, and the facility also offers taxicab and bike-sharing services.